Ferdades is the noble, well moving and pitch-black, poetic picture of a stallion. This outstanding Fürstenball-son was licensed during the Oldenburg licensing in November 2017. In 2018, he finished his 35-days performance test with a total score of 8,16 points and among the scores he had 8,5 for the canter, rideability and capacity. He has inherited the quality from his strong mare line, where the dam, Daylight, also produced the licensed stallion, Zoul Mate. 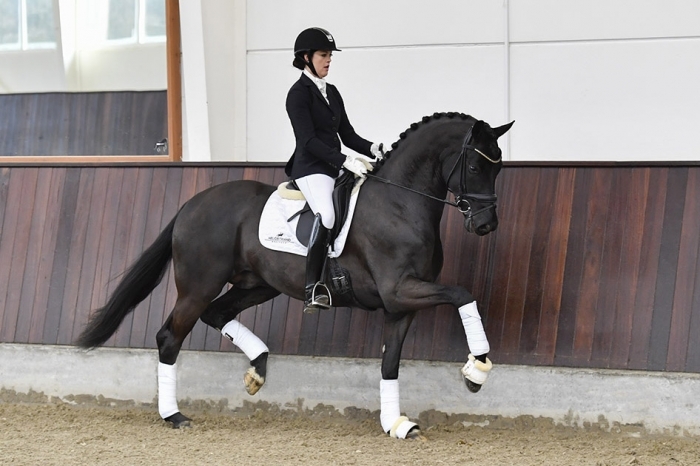 Ferdades is by the champion stallion, Fürstenball, who is in the leading position of the German breeding index for dressage horses. Fürstenball sired more than 50 licensed stallions and other famous sports horses such as Heilines Danciera, Fiesta Danza OLD and Feodoro. Fürstenball was also successful up to S-level himself and in 2018, he was announced as stallion of the year in Danish Warmblood. Fürstenball is said to have inherited the qualities of his father, the world champion, Fürst Heinrich, along with the ones of his grandfather, the top sire Donnerhall. With Donnerhall as his grandfather, Ferdades is a promising stallion choice for functionality and rideability. Ferdades is licensed in the Oldenburger Verband and Danish Warmblood. Ferdades is stationed at Helgstrand Dressage.